The Chinese government has recently expanded the scope of urban social insurance programmes. However, social protection for the labour force of the urban informal sector, which reaches about half the number of urban workers, lags significantly behind. This under-coverage may be due to institutional constraints, particularly the household registration system hukou, and self-selection behaviour related to the limited benefits of social insurance. Drawing on a recent nationwide individual-level survey and city-level statistics, this study examines these two explanations for the under-enrolment on the social insurance programme. First, results suggest that hukou and the intergovernmental fiscal system are major institutional constraints. Second, self-selection behaviour in programme enrolment is verified. Employers in the informal sector are likely to opt out of social insurance. 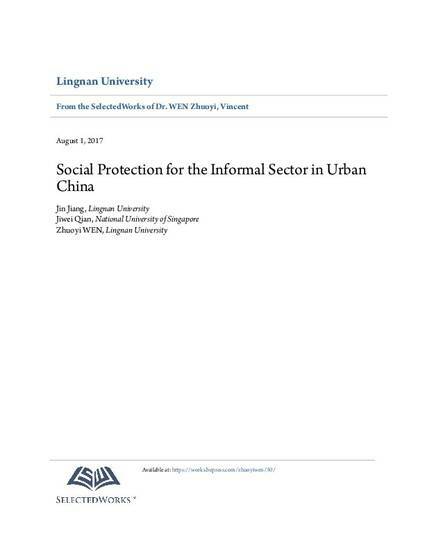 More importantly, employers in the informal sector, with rural or non-local hukou, are likely to opt out of social insurance, which suggests that self-selection behaviour is constrained by institutions. Such findings have important implications for broad theoretical and policy debates on universal social protection.